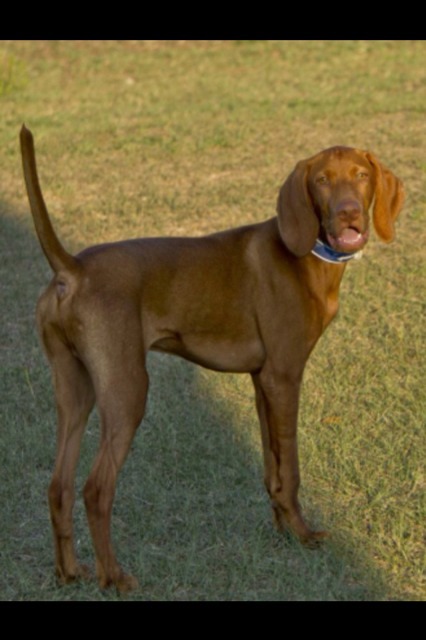 Hungarian Vizsla Forums > General Vizslas > General Vizslas > When do they stop growing? I was just wondering the average age when viszlas growth slows down and stops. Hercules is now 6.5 months old and weighs 22kg (48lb). I met a 2 year old male v today that was the same size as him. Will the growth start slowing down soon or is he going to be a mammoth? Re: When do they stop growing? My Phoebe hit her size pretty close to one year. She has put on a few pounds since then (currently 22 months old and 48 lbs) but is quite close to the same size/weight as when she was 11 months- 13 months. My guy is about 65lbs now at 9 months. They do slow their growth some at about 7 months, but continue to grow. It seems to me that they reach "almost" their adult weight/height by the age of one year, but... they keep growing, albeit much more slowly, until the age of two years. At least that is what I have seen. That's what I have seen in mine. They did get wider once they are at a mature age between 2 and 3 years old. At 14 months, Darcy is still growing (although slowly now). I'm sure that no matter what her eventual size, she will not disappoint. Welcome to the forums!